I can't remember to take my cell phone with me when I leave the house, or to actually turn the washing machine on after loading it with clothes and detergent. But I remember where I was on a random spring weekend 18 years ago. When I last landed in the Norfolk International Airport, it was rinky-dink. It's exponentially larger now with the personnel needs of the massive Naval Station Norfolk to be met. 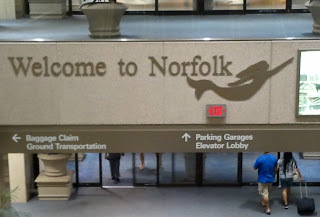 Anyway, it was April 8 1994, and I arrived in Norfolk for the Championship game of the Portsmouth Invitational Tournament (the P.I.T. ), an annual college basketball postseason all-star game. But my concentration was shaken when I woke up the next morning with bad news on the doorstep - Kurt Cobain's death three time zones away was on the front page of the Norfolk, Virginia local paper. It was the 1990s version of the day the music died. It was a pretty ordinary assignment, except it was more of a showcase for all the NBA scouts than an actual game. What lifted the broadcast was the unconscious shooting of Kansas State's Askia Jones. I know the tape exists somewhere, but the game story is a little hard to find. Jones' performance was a little hard to put into words anyway. He won the championship game practically by himself with 30 points on 8-of-8 3's to follow up a recent 62-point performance against Fresno State in an NIT Quarterfinal. The NBA people were there, they saw it, they had to take notice. He was as hot coming into the draft as you could get. Yet Jones went undrafted and had just a cup of coffee, 11 games, in the league. Was it all just a dream? As Kurt Cobain might say, Nevermind.